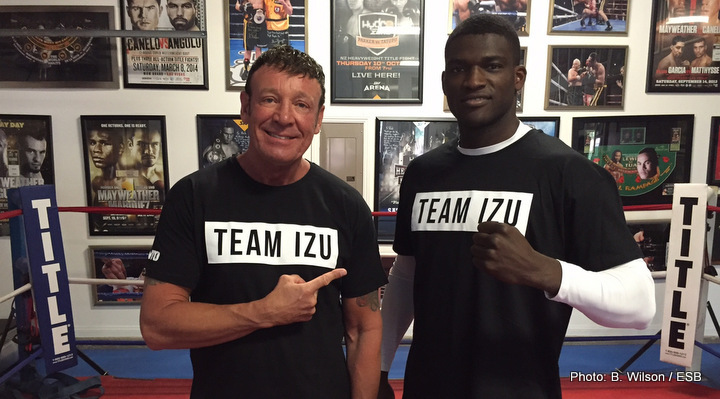 It’s been an interesting 18 months for Polish heavyweight contender Izu Ugonoh. After moving to Las Vegas and hooking up with veteran trainer Kevin Barry, Ugonoh found his career tracking in the right direction with a busy schedule in 2015 that saw him own a highlight reel KO over Will Quarrie accompanied by a steady rise to number 15 in the WBO rankings. Just at the point of launching into the next tier of higher ranked heavyweight opponents Izu, whose sporting profile was now growing steadily in his native Poland, was offered an opportunity to appear on their version of ‘Dancing with the Stars.’ With the potential to exponentially grow his fan base and popularity in Poland being too good to pass up,Izustarted the year by trading in his boxing gloves for dancing shoes. In an ideal world Izu’s foray into the world of reality television would have lasted a few weeks, bumping his name recognition in the process before being voted off the show and returning fairly quickly to the squared circle. However, the competitive instinct that is the mark of any top level sportsman soon kicked in and Izu through hard work and dedication soon became one of the favourites to win the whole competition, making his way to the final 4 before finally being eliminated. And now here we are back at the Pullman Hotel in Auckland New Zealand, as Izu prepares to face his next opponent, Argentinian Ricardo Ramirez on the undercard of Joseph Parker’s next fight on July 21st against Solomon Haumono at the Horncastle Arena, Christchurch. Now with drills over for the day, Izu and I sit down to discuss what he has been up to over the past few months. I startby asking him what it was like watching his good friend and training partner Joseph Parker engage in a tough fight with Carlos Takam for the IBF title eliminator spot. I’m particularly curious to know what it was like for Izu to not be there for that moment, especially as he and Parker have been so used to doing all their training together. It certainly brings an energy to the camp that maybe wasn’t there for Joseph’s last fight. Working together works I guess. Speaking of such, I’m also wondering how difficult it has been for Izu to reintegrate himself back into a tough camp especially coming off a long layoff like the one heexperienced in Poland? Six months without that physical contactmust make it difficult to adjust? Surprisingly Izu contends that it wasn’t so much of a problem at all. I also assume that although six months is probably longer than ideal, there would have been a certain amount of mental refreshment that came with the break? I ask him the simple question; what sort of things would you change? As much as dancing may have been a chore at times for Izu it was obvious though that the hard work paid off as he routinely scored 10’s on the show and made it all the way to the semi-finals. I ask him what his perspective is now he has left the show? And turning his thoughts to boxing, now that the profile has been built in Poland what are the next steps for him? I also wonder with several other high profile Polish heavyweights out there, whether it will be a domestic affair or just an opponent that will constitute a step-up in Izu’s career? With that being so, I ask Izu if he and Kevin Barry have looked at specific names for the next fight? So a local derby, which I know are routinely massive events in England isn’t necessarily on the cards for you right now? It seems like a fairly logical response but it would also seem that this means Izu will be looking at a top 15 or top 20 type opponent soon? Looking at Izu’s upcoming fights, I put it to himthat having recently sparred world champions such as Bermane Stiverne and Wladimir Klitschko as well as world rated stable mate JosephParker, it must be a challenge at times to find the motivation to face an opponent several leagues below that sort of calibre of fighter. As we are winding the chat up Izu laughs and jokes around just shooting the breeze, happy with an almost serene sense of calm to be back doing what he does best, which is talking, walking and breathing boxing. Put the dancing shoes away, the boxer is back in town. Izu Ugonoh 15(12)-0 faces Ricardo Ramirez 13(10)-1 at the Horncastle Arena, Christchurch, New Zealand on July 21st.